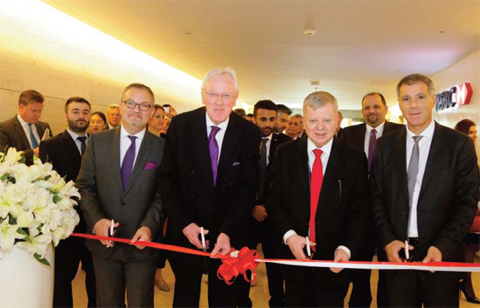 KUWAIT: HSBC Bank Middle East Limited in Kuwait inaugurated the new offices in Al Hamra Tower yesterday during a special event attended by The Lord Mayor of London, dignitaries from the British Embassy in Kuwait and customers. This was the official opening of the new offices that are located on the 37th Floor in Al Hamra Tower. The new offices in Al Hamra Tower bring the Bank closer to the business hub of the city and even closer to its clients. It also gives HSBC easier access to decision-making centers and will streamline service offerings to its current customers. HSBC values the importance of good quality working environments for its employees, and the new offices underline the value of investing in their well-being. The Bank adapted the new lay-out to be in line with international standards that offer open office spaces, access to break-out rooms and state-of-the-art facilities for meetings. Al Hamra Tower was recently awarded with the “Smartest Building” in Kuwait award based on its connectivity, safety, energy efficiency and quality of life it offers to its occupants. “We understand the importance of a working environment that is conducive to friendly and open working conditions that enhances employee engagement and productivity. Our employees are our most valuable asset and an investment of this kind is proof to the priority that we place on their well-being,” Roger Winfield added. The Bank, over the last decade, also greatly invested in the nationalization of its workforce and has a growing number of Kuwaiti employees. “Investing in the development of local talent is equally important. We are an international bank in Kuwait and need to invest in the local human capital for the sustainable growth of the community and its people.” Roger concluded.